Nikhil (Sidharth Malhotra) is sentimental and confused. He is a stark contrast to most of today’s generations who have problem in committing into relationhips and no-problem in breaking up. Meeta (Parineeti Chopra) is a rebel with the brain of a genius. She is practical and real mental. She is the family’s black sheep and father’s pet. Karishma (Adah Sharma) is practical and materialistic. Her thoughts are that of a common man who fears society and what others think! The plot is nothing new. It is the same age-old triangular love story. But what makes this a joy-watch is the coming-of-age treatment. The characters come across as a breeze of fresh air. 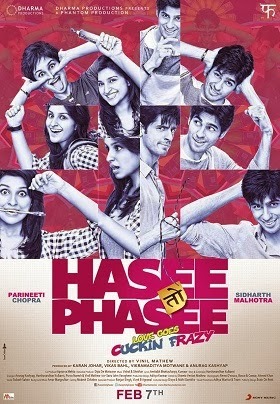 Nikhil is confused and Meeta is rebellious. They are no great white or black! There are several laughter evoking moments. Scenes like the shopping trip, face-to-face conversation with the would-be father-in-law and the embarrassing where-did-the-jewel-go stay in our hearts. Ah! That anthakshari between the families of bride and groom; hilarious! The characterization of Meeta’s father (Manoj Joshi) is something worth mentioning here. He is not a clichéd father. He is understanding and progressive. Thumbs up! In short, though the premise and climax is a cliché, the way it is handled is no-cliché. It is quirky and different. Amrit... I love her too! And this is "her" movie..
Cant agree more Sayta.. Meeta was awesome.. and Zehnaseeb got me addicted..
Chinmayi voice was amazzzing, especially the lines "Tere sang beete har lamhe pe humko naaz hai.. Tere sang jo na beete uspe aitraaz hai.. Is kadar hum dono ka milna ek raaz hai.. "
:) just fell in love with it..
Hey Kannappa, I am happy that you agree with my review..